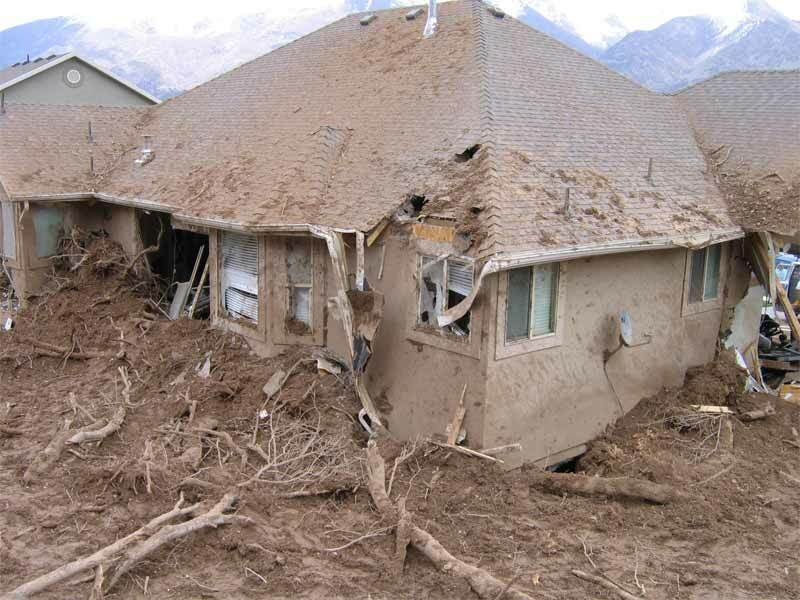 Around 9:30 p.m. on Sunday evening, April 9, 2006, a hillside in South Weber above a house at 7687 S. 1650 E. failed, flowed over the recently covered Davis-Weber Canal at the base of the slope, and impacted the back of the house below the canal. 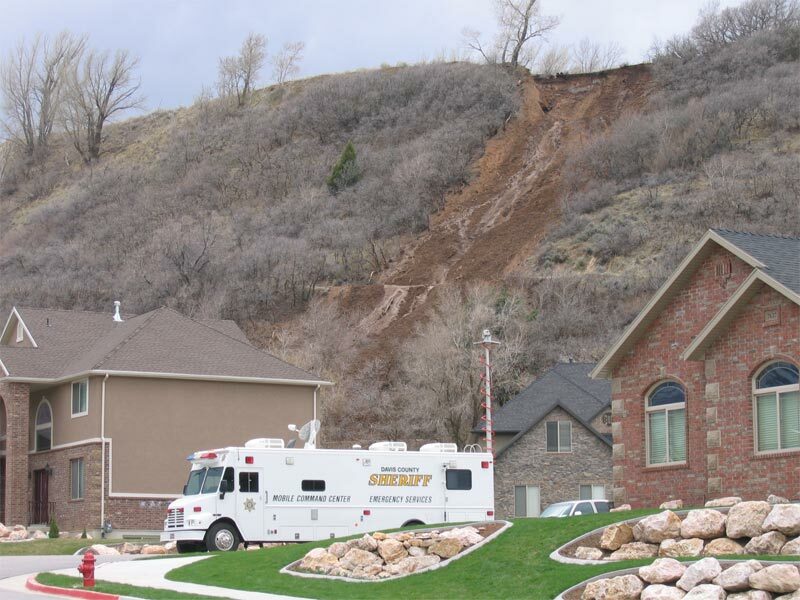 The failure originated at the top of the hill and flowed rapidly down the slope, crossing a dirt road, the canal, and a rock wall at the back of the lot before hitting the house, causing significant damage and injuring a child inside. Because water has not yet been turned into the canal for the irrigation season, and it has recently been covered through this area, obstruction to flow in the canal by the landslide was not an issue. The slope that failed above South Weber has experienced other recent historical failures. The slope was formed as Lake Bonneville receded and the Weber River cut down through the old Weber River delta that had built into Lake Bonneville 16,000-18,000 years ago. 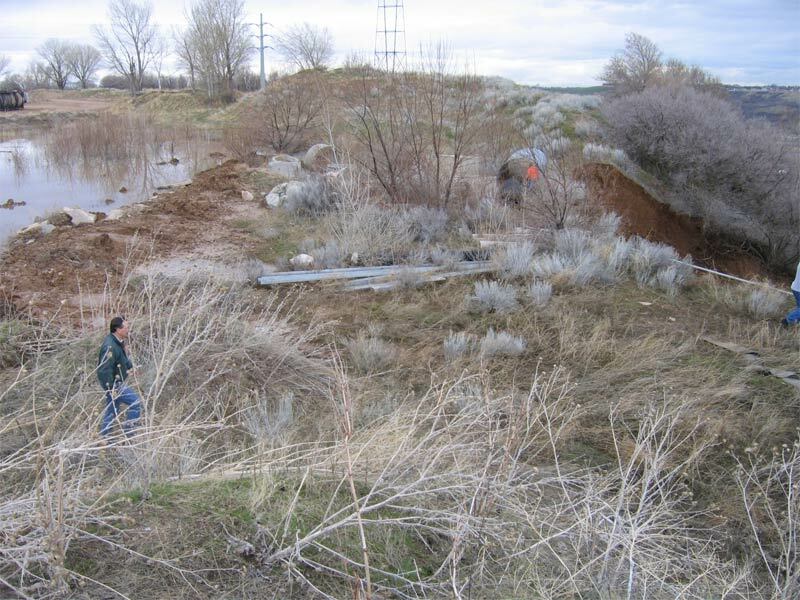 The relatively fine-grained material in the delta is prone to landsliding, and slopes in this area on both sides of the Weber River Valley in South Weber and Washington Terrace have failed repeatedly in the past. The relatively long and rapid runout of the April 9 landslide, and last year’s February 20, 2005, 435 East South Weber landslide just 2 miles to the west, indicate the risks involved in building close to the base of these slopes. The upper part of the slope has been modified over the years by gravel-pit operations on the bluff top, about 200 vertical feet above the subdivision, and loose material had been pushed onto the slope and an embankment built to prevent water from flowing over the crest and down the slope. 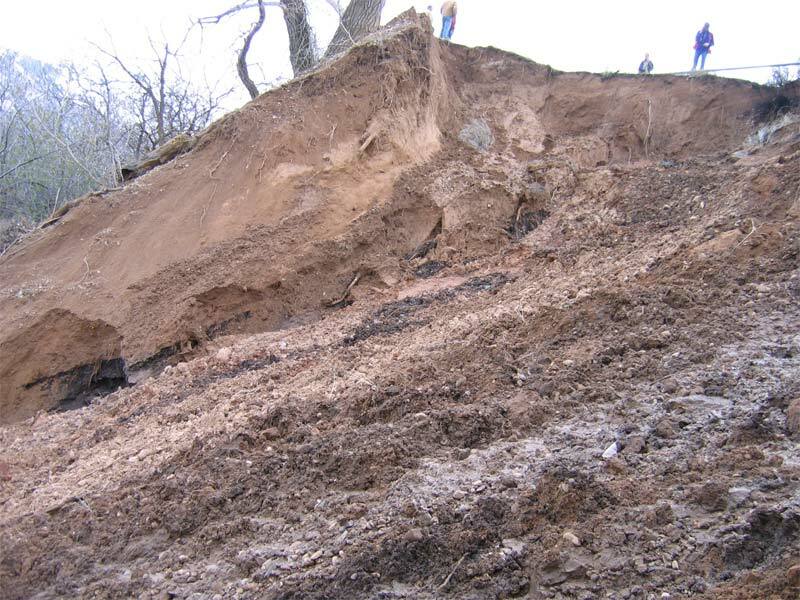 The landslide was a rapid earth flow that occurred in a steep (more than 50%) part of the slope, and much of the material in the initial failure was human-placed fill. The landslide is about 80 feet wide and 600 feet long. The head of the slide is about 75 feet from a pond in gravel pits on the bluff top. Adjacent to the landslide near its head we found “piping” holes that indicate active underground seepage. 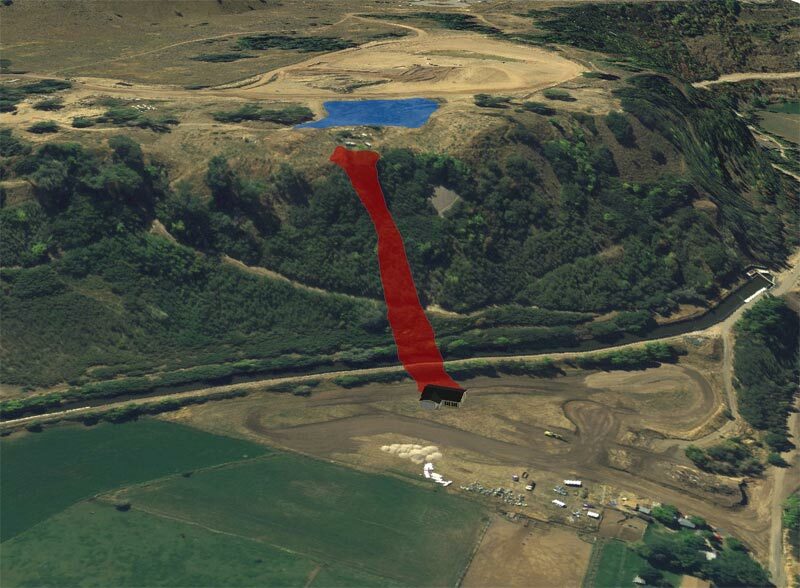 These piping holes indicate that saturation and seepage were occurring through the embankment and underlying soils, mostly fill, near the head of the slide, probably causing local instability and ultimately the landslide. The pond is being drained to lower the ground-water table at the top of the slope to prevent saturation of the slope crest. However, vegetation types at the bluff top, particularly large, old cottonwood trees, indicate that shallow ground water is a common occurrence in much of the area. Test pits excavated on April 10 at the top of the slope encountered shallow ground water, in places less than 10 feet deep, perched on clay layers beneath the gravel beds capping the bluff. 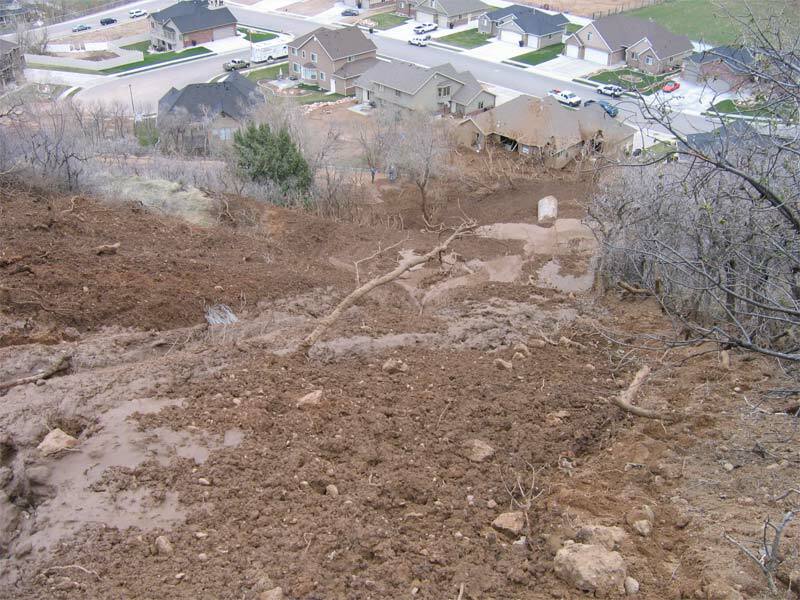 Much of northern Utah is experiencing a second consecutive wet year, following last year’s very active spring when the UGS recorded over 100 landslides, including the425 East South Weber landslide on February 20, 2005. The UGS monitors ground-water levels in other landslides in northern Davis County, and we’ve noted a significant rise in ground-water levels between mid-March and April 10, probably in part a result of the significant snow and rain that fell on April 6.